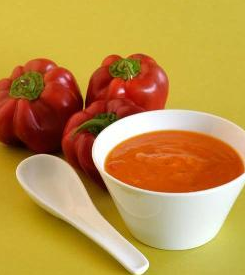 Red Capsicum « Geetika's Recipes! Pierce the red capsicum with a fork and roast them over a flame till they turn black. Cool, wash them and remove the skin, stem and seeds. Keep aside. Cut the tomatoes into quarters and add approx. 3 cups of water, bay leaves and garlic and boil till the tomatoes are soft. Discard the bay leaves and keep aside. Purée the capsicum and tomato mixture into a smooth paste. Mix the corn flour and milk and add to the paste. Add salt and simmer the soup for few minutes till it thickens.